Grilled Dover Sole with Brown Butter Sauce and capers is a simple but sublime dish that takes very little time to prepare or cook. You must apply your full attention to both the grilling of the sole and browning of the butter. All it takes is 30 minutes maximum from start to finish but you must spend those 30 minutes in the kitchen the whole time! Dover Sole is such a meaty and succulent fish that it only ever requires careful cooking and a light hand with the sauce. 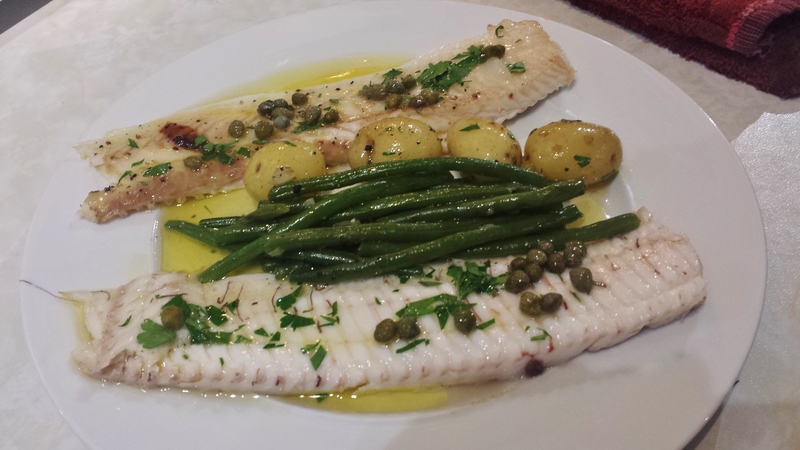 Add a few boiled new potatoes and green beans and you have a delish Dover Sole dinner! The Dover Sole can be cooked whole or filleted. If you have the fish filleted the cooking time will be reduced to about 5 – 6 minutes and you don’t need to turn the fillets during the cooking. The Brown Butter Sauce is simply butter that has been boiled and the milk solids turn a nutty brown color. To this you add capers and serve. . Step 2 Cut the butter into pieces and place in a small saucepan. Over moderate heat swirl the butter as it melts and foams up. Continue cooking for a few seconds as the foam subsides and the butter starts to color. As soon as it is a nutty brown remove from the heat and add the capers. Step 4 Preheat the oven to broil. Line a baking pan with foil. Brush the foil with butter. Brush one side of the fish with the butter and season with salt and pepper. Lay on the pan buttered side up. Place the pan in the oven, 5-7cm/2-3 inches from the heat. Cook until just firm and cooked through, having lost that translucent look – about 3-4 minutes. Carefully turn the fish over and brush with more butter, season with salt and pepper and return to the oven for another 3-4 minutes. If you are unsure when it is done remove the pan from the oven and with a fork pull the flesh from the bone. It should just give way but not flake apart. It will continue to cook as you fillet and plate the fish. Step 5 To fillet a whole Dover Sole, first remove the fins and little bones around the outside of the filets, these should just detach using a butter or fish knife. Then slide the fish knife between the fillet and the bones from the top of the fish to the tail. Then run the knife alongside the backbone and the fillet. Lift the fillet off the bone onto a plate using a fork and knife. Continue in the same manner for the remaining fillet. Then turn the fish over and repeat the process for the additional two fillets. Be sure to serve the roe which is often hiding under the fillets. Sprinkle on the parsley. Step 6 Gently reheat the butter sauce and dress the fillets with the sauce.